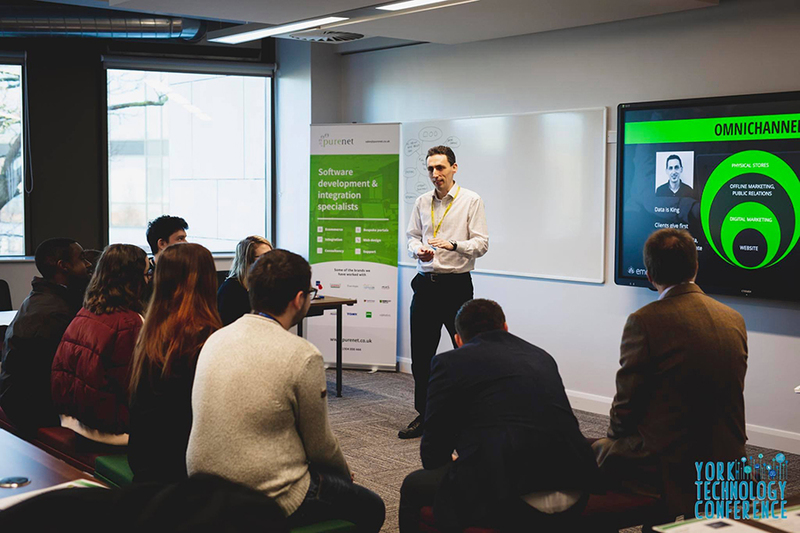 Daniel Woolfson, Head of Development & Test at PureNet Solutions and Magium Commerce, talks about his recent experience at the York Technology Conference, where he led an interactive seminar on Psychology of How to Sell Things (And You). For the York Technology Conference, I teamed up with my colleague Kora Habinakova, Marketing Manager at PureNet and Magium to deliver a thought provoking conversation based around how online stores directly influence people’s buying habits and how to sell to your subconscious. Entitled “The Psychology of How to Sell Things and You”, we gave examples of Entry to Market and Omnichannel experiences and related this to Personal Branding, self-concept and a focus on Cognitive Dissonance. In an interactive seminar we posed different views. I took on the role of the data-led Analyst, who spoke about how software should be bespoke, requirements-led and so should be your CV – accurate and full of information. Kora played the role of the Creative – who wants to go to market with good presentation and with an emergent strategy of sculpting any campaign. Selling yourself in a story-based language over specific details was the message here. After each section we spun out into groups who voted with their feet to continue the debate with professed ambassador of the moment to showcase the volatility of consumer-led decisions and the importance of branding. At the end – we revealed that, actually, Kora and I agree with each other in that you need a little of both approaches to create data-led experiences that resonate with audiences and empower brand advocacy. For the rest of the day we had the pleasure and honour to listen to high achieving University of York Alumni speaking about their experiences in Tech. Key highlights were “3 simple steps to making your first million as an IT entrepreneur” by Darryl Mattocks, Managing Director & Founder of Enistic. A key takeaway here was to select a KPI to aim for the “hockey stick effect”. Find an attribute that you can attach a metric to in your business, sales, customer satisfaction etc and work on making this rise. Then graph this to show investors that you have positive sustained continued growth. Robin Pembrooke, Director of Content Production Workflows at BBC, presented his and BBC’s views on machine learning and data science in content production for TV and online. Robin spoke about digital transformation and how it impacts a large organisation such as BBC, who operate on the premises of up-to-date content and how technology, and artificial intelligence specifically, can help streamline internal processes to deliver fresh, targeted content to different audience segments. Another key speaker on the day was Helen Bowyer, Emerging Technologies Manager at IBM, who told us about “Delivering Innovation in Emerging Technologies”. Amongst other inventions and key technical increments work in progress was lattice cryptography. This is a new security method which hides data inside complex math problems (algebraic structures) called lattices. This will also allow people to perform calculations on a file without ever seeing sensitive data or exposing it to hackers. Overall it was a very well organised conference run by students and aimed at connecting students with local business professionals like us. We hope our advice we imparted on the day encourages more to take the path of a career in Tech. We also hope to lay the foundations for the next generation to work in jobs that are yet undiscovered. Speaking at and listening at tech events such as York Technology Conference lays this pathway for those who choose Tech as their career path.